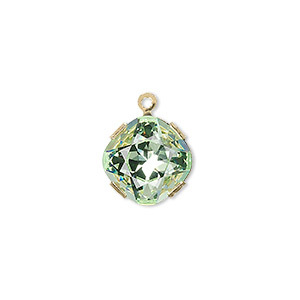 Drop, Swarovski® crystals and gold-plated brass, chrysolite, 13x13mm diamond (18704). Sold per pkg of 24. 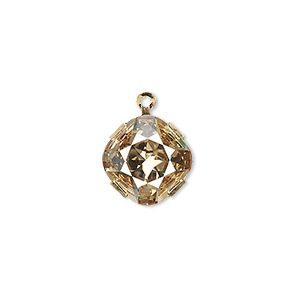 Item Number: H20-7932FY Have a question about this item? 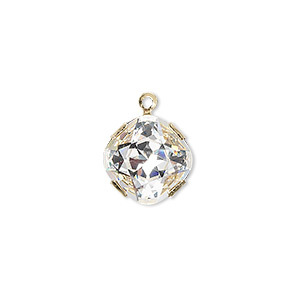 Sparkling and exquisite Swarovski crystal fancy stone drops are leading jewelry designs with their sophisticated flair and statement size. 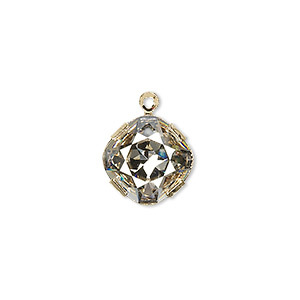 Attach to leverback or fishhook earwires for instant earrings. 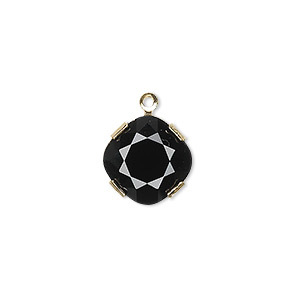 Add a jumpring and slide onto chain or leather cord for a fabulous necklace. Dangle from a sparkling bracelet for extra charm. The possibilities are endless. Drop, Swarovski® crystals and gold-plated brass, chrysolite, 13x13mm diamond (18704). Sold individually. Drop, Swarovski® crystals and gold-plated brass, chrysolite, 13x13mm diamond (18704). Sold per pkg of 48.